Begin your mountainside adventure when you stay at this 3-bedroom, 2-bathroom vacation rental cabin in Little Valley! The property is nestled in the woods, offering ultimate peace and serenity with a view of the treetops. Sleeping up to 6 guests, the property is ideal for a family or group of friends seeking a relaxing and rural retreat. You’ll be just 6 miles from Holiday Valley Ski Resort, surrounded by beautiful hikes, and a short drive to neighboring Ellicottville for shopping and dining! Upon arrival, you’ll fall in love with the privacy and tranquility of the cabin. You’re sure to make good use of the large patio, complete with outdoor seating and stunning treetop views that overlook the mountains and entice your sense of adventure! Inside, the home is well appointed with all the comforts and amenities of home so that you can settle right in and make yourself comfortable. The living area features soaring vaulted ceilings that open up to the loft space, creating a welcoming and cozy feel. Take a seat on the comfy sofa and warm up by the electric fireplace as you wait for dinnertime to arrive. Preparing delicious home-cooked meals in the well-equipped kitchen is a breeze with ample counter space and updated appliances at your disposal. Set the dining table to share supper with up to 6 and share stories from your adventure-filled day! After dinner, head up to the loft where a plush sofa and reclining armchair are arranged in front of the flat-screen cable TV. Browse for your favorite movie or challenge your companions to a board game for a fun evening activity! As bedtime approaches, make your way to one of the well-appointed bedrooms to get ready for a peaceful night’s slumber. The ground floor bedroom features an inviting queen-sized bed and soft, warm lighting. 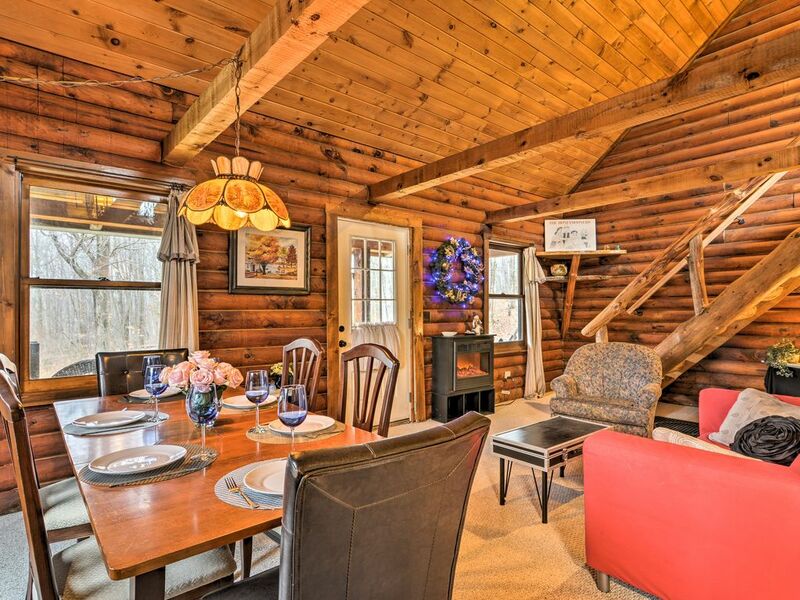 The property is in a prime location for outdoor enthusiasts and skiers of all skill levels! Less than a 10-minute drive will take you to Holiday Valley ski area and HoliMont Ski Club. The Ski Club is an excellent destination in any season, offering a variety of activities including golf, aerial adventure park, mountain biking, tubing, nordic skiing, and more. Head to downtown Little Valley and spend an afternoon strolling along the main streets, where you’ll discover unique shops and local eateries. Visit the Nannen Arboretum in neighboring Ellicottville, featuring 8 acres of meticulously manicured gardens. Ellicottville is also home to one of New York’s favorite craft brewers, Ellicottville Brewing Company. Stop by for a taste of some house ales and global grub pub. - Amenities include a well-equipped kitchen, flat-screen cable TV, DVD player, free WiFi, landline phone, large deck, outdoor furnishings, firepit, laundry machines, on-site parking, and more! - Convenient Little Valley location - Just 6 miles from Holiday Valley Ski Resort, less than 10 minutes to Nannen Arboretum, HoliMont Ski Club, and Ellicottville, and only a 20-minute drive from Rock City State Forest! Lovely log cabin! Would recommend this property & would come back. We enjoyed our stay, with cheese fondue and chili the first night, and seafood Chablis the second. We went in to town and sampled beer at the brewery and explored the shops — a new helmet and poles for our youngest, and cupcakes for our daughter. Overall, our stay was just what we expected. Except the beds are firm so one person slept on the pullout couch and said it was better. Plenty of room for 6 adults, the kitchen had what we needed, and the cabin was warm and cozy. This property is beautiful and better than the pictures. Very clean and plenty warm in the winter months. there are also plenty of supplies in the kitchen and bathrooms that there is no need to bring your own. We stayed for a weekend in November with our 4 kids and everyone absolutely loved it. We are already planning to stay again next summer and enjoy more of the back deck and fire pit! This was the perfect weekend getaway. We live in Buffalo and wanted to get away for the weekend for my husband's birthday. It was such a cute and quite cabin, we didn't want to leave! Will definitely be back this summer / next winter! Great, cozy cabin in the woods! We had a great time staying at your cabin. It was the perfect place for our weekend getaway! Close enough to downtown ellicotville but sucluded in the woods. Quick fifteen minute drive to Holiday Valley. No complaints!! Thank you!